Gameinformer did a review on Re:coded. 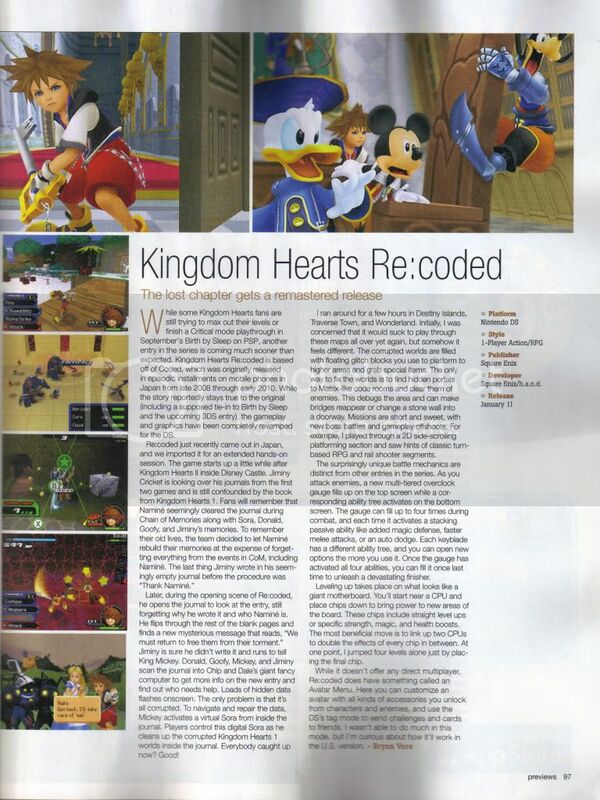 Nice find, good that GI is giving KH some attention for once. I'm...kinda surprised GI said something positive. Don't think they've really done so recently. sweet. what month magazine is that for? It's the December issue. The November issue has no KH in it. I recall them saying something positive about Birth By Sleep, which got a score of 8 or 8.5.. The only bad thing they said about it was the repetitiveness. Which sadly up to one point is true. Awesome...KHI should update the front page with this. And speaking of updates, has anyone else noticed that the little Newsflash tab at the top of the main page is sorely neglected? Figures. I think my subscription ended right before that issue. I find that Re:Coded is actually being looked upon by many editors for game maganzines, sites, etc. which is good because I don't think SE really promotes Re:Coded to any extent.